FREE PREVIEW Full wordlist and sample entries are available to preview the dictionary content and to try the app functionality. _____________ With 140,000 words, phrases and examples, meanings, British and American English word pronunciations, Cambridge Advanced Learner's Dictionary, fourth edition is trusted by millions of English learners worldwide. Every dictionary entry has thesaurus sections that show related words, phrases and synonyms for each meaning, helping you to expand your English knowledge. Informed by the Cambridge International Corpus, the dictionary is ideal for IELTS, BEC and Cambridge English: First, Advanced, and Proficiency exam preparation. User Reviews	***** Great for those who learn English. ***** My favorite dictionary ever! 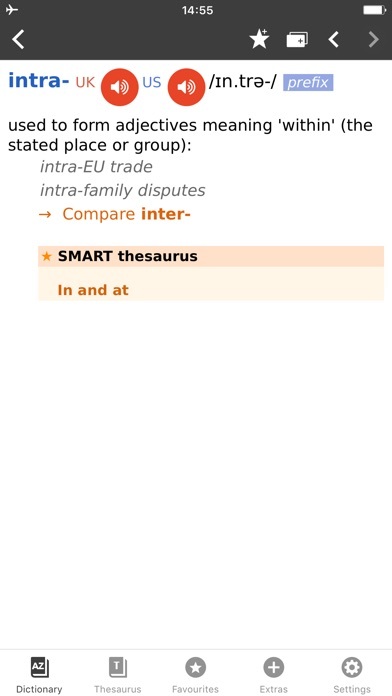 ***** Smart thesaurus is awesome!! _____________ Learning Features: • British and American English audio pronunciations, recorded by native speakers • SMART Thesaurus feature gives you related words and phrases at every definition, , not just synonyms • Flash Card Quiz to help you memorize new words • Favourites - to help you quickly access frequently searched words • Search History to revise your recent searches • Table of English Irregular Verbs provides a useful reference resource Search Features: • CALD will understand and find a word from any grammatical form • iOS Share. Select any text on Safari sites, emails and share with CALD to get words’ definitions • Multiple clipboard look-up. 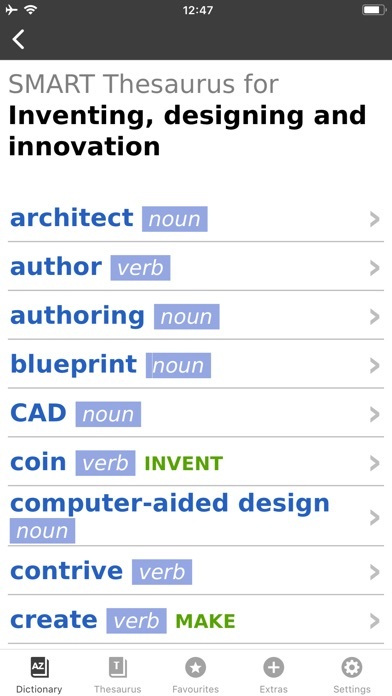 Copy any text from other apps and view the words’ definitions one by one when you open the CALD • Full Text Search. 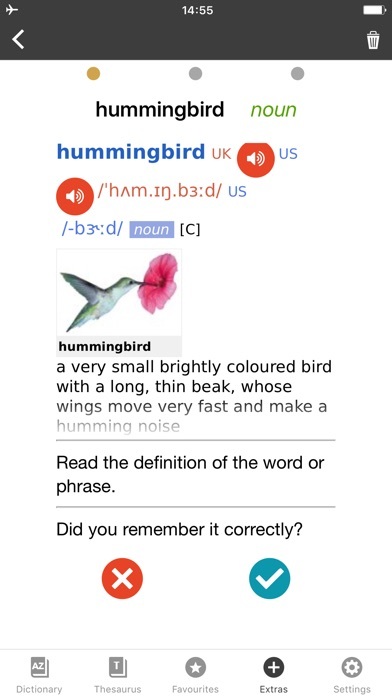 Look up words throughout the whole dictionary content, including headwords and usage examples • Similar Words Search in case of misspelling • Wildcard Search. Use “?” and “*” symbols to replace letters if you’re unsure of the correct spelling. 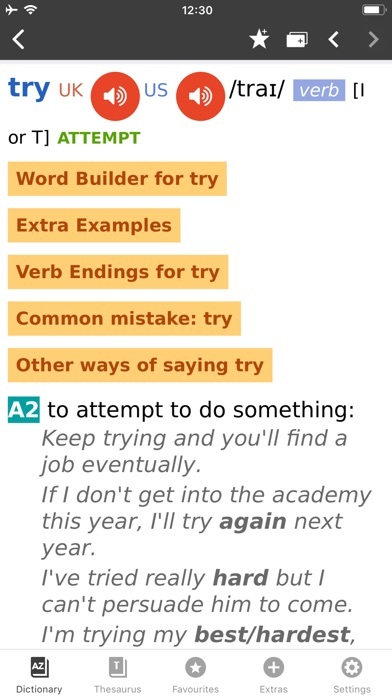 • Anagram Search (e.g. tab-bat) • Hyperlinks between entries: tap on the word in the article to see its definition Interface Features: • No Internet connection required • Modify animated menus and choose background colours • Enlarge or reduce font size for your comfort • PenReader multilingual handwriting recognition support About Cambridge Founded in the mid-16th century, Cambridge University Press is a world-leading publisher of English learning materials. Playing a leading role in today's global educational market, Cambridge University Press publishes titles written by authors in over 100 different countries. I get that the app should be profitable in some shape or form, but to prevent the general usage of the app without paying $10+ USD just sounds uninviting, especially since the browser version of the Cambridge dictionary is free to use. I’d understand if the app pushes for purchase of the dictionary during offline mode, but the charge during online mode just seems counterintuitive. The rating I’m giving to this app isn’t based on its functionality or interface. Rather, it’s a rating for the poor business model. Its really great dictionary for who wants to learn English more useful. The categories of words are amazing. This dictionary is completely different from other kinds of dictionaries. I really admire and enjoy. Huge disappointment, since the web version is totally accessible for searching and exploring all kind of words and some good features.I was expecting to experience the same thing in the app, i even created my own words list on the web version hopping to Synchronizing it via the application but none of these were available unless you buy the whole version which the price of it is a bit exaggerated. I think I’m gonna stick with the web version until i find another alternative. If you think about sharing with family, forget it. the information that can be shared is misleading. 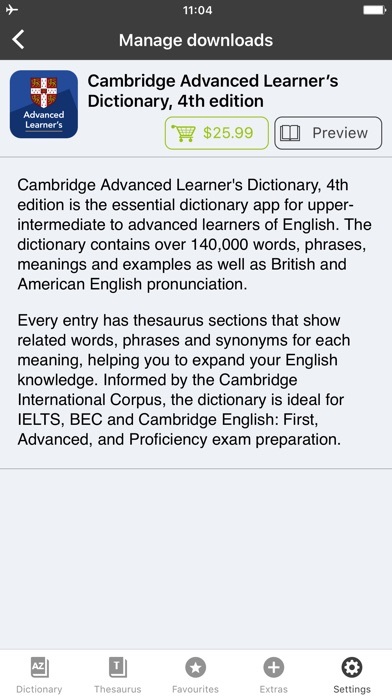 Cambridge Dictionary is one of the best dictionaries that I've ever owned to get better knowledge of English! Especially with the verbs, adjectives and nouns are very cool to study! I also love on how they allow us to use British and American accents! Thank you very much for teaching me! Spending over $20 for a dictionary app compared to having free access to online dictionaries or even other dictionary apps just doesn’t make sense. That being said, I think you guys would make way more money charging $5 once for everything than to charge over $20 for your current dictionary (assuming we have to pay each time you update the dictionary). You want more people to buy, not just like 3 people. Remember that they can just go to your website and use it for free. The alternative would be to make a paid app for like less than $5 and not charge for anything else.